Most chickens are kept on farms for the agricultural production of meat and eggs but some chickens are kept as pets for entertainment and educational reasons. Colour - Red, Black, Brown, White, Yellow, Orange. Chickens were one of the first animals domesticated by man. The main attraction for many potential owners is the prospect of fresh eggs. Chickens are energetic, inquisitive, and friendly animals who are a joy to watch, but the decision to keep them should not be made lightly. The chicken (Gallus gallus domesticus) is a domesticated fowl, a subspecies of the Red Junglefowl.Fowl had been known in Egypt since the mid-15th century BC. Recent genetic studies have pointed to multiple maternal origins in Southeast, East, and South Asia, but with the clade found in the Americas, Europe, the Middle East and Africa originating in the Indian subcontinent. As one of the most common and widespread domestic animals, with a population of more than 24 billion in 2003, there are more chickens in the world than any other species of bird. They will usually live between four to seven years. There are many different varieties of chicken, but if you are keeping them for their eggs, then the larger breeds or hybrids are probably best suited to you. Hybrids will each lay one egg per day, although this will slow during winter and when they get older. The house and everything inside should be cleaned frequently and disinfected to remove parasites. Food and water should be provided in the house. Each week remove the shavings from the house and nest boxes, brush everything out of the corners and replace with fresh bedding. Food and water containers should be washed and dried regularly. At least once a month scrape the perches and disinfect the house with a pet friendly disinfectant. It is best if the chicken coop is treated regularly with a mite powder and nest boxes dusted weekly with a louse powder. As a guide, if their feet or eggs are dirty, it may mean that their coop needs to be cleaned out more often. Flooring - Covered with dry material (e.g. wood shavings or straw), to allow foraging and dustbathing (particularly important when it’s wet outside). This must be topped-up or replaced when needed. Space - Enough for chickens to exercise, stretch their wings and carry out normal behaviors. As a guide, roughly 12 square metres should be enough for 30 birds. Although this depends on the size and numbers of chickens and layout of facilities. Should be around 3 to 5 centimetres wide with rounded edges and height should suit the size of the birds. Should provide enough space for all chickens to comfortably roost at the same time (from 15 centimetres per chicken), and enough space between perches to let them get up and down without injury. Egg laying hens need quiet, enclosed nest boxes. Should be draught-free and lined with clean, dry, comfortable nesting material (e.g. straw or wood shavings). Fences should be well maintained and provide protection against wild animals. Ensure that the birds cannot escape or become trapped/injured. They will quickly learn that their owner brings them food and will follow you around as if you were leader of their flock.When they are tame, be careful when eating outside as they will quite happily jump onto tables and steal tasty things out of your hands. Most hybrids are similar in size and colour, so if you want to be able to identify them easily and give them names, you can differentiate them using coloured leg rings. Chickens need constant access to clean and fresh water in the chicken house. Drinkers should be cleaned regularly. Chickens must be able to access water in icy weather (ice should not be removed using chemicals). Drinkers should prevent young chicks climbing in and drowning. If drinkers are changed, the chickens should still be provided with some of the type that they are familiar with. Feed, suitable for their age and breed, should be provided in the chicken house to give them a balanced diet. Food dispensers should be cleaned regularly. Chickens need insoluble grit to help digestion (e.g. hard flint grit). Oyster shell is a soluble grit which can provide extra calcium in the diet. If you want chicks, you’ll need a rooster. As a rule of thumb, 10 to 12 hens per rooster is a good ratio. While you could build an incubator and supervise the development of the eggs, it’s easiest to let the hens take care of hatching. A hen that is getting ready to nest becomes “broody.” This means that she wants to hatch her eggs. She’ll sit “tight” on the nest and resist having her eggs collected, whereas a nonbroody hen will let you reach under her to collect eggs. 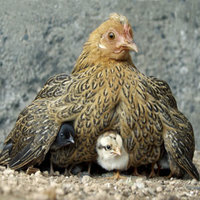 A broody hen may even peck or screech at anyone coming near. There are ways to discourage broodiness, but why would you? The hen does the work of hatching and raising, and you get free chicks! Farm chickens can live 4 to 7 years and lay eggs for most of that time. Every year they go “off-lay” (stop laying eggs) for several months. This happens over the winter, when there’s too little daylight to trigger egg-laying. They’ll begin again in the spring. As with all pets, if you are concerned about any aspect of their health you should consult an appropriate vet. In the peak of fitness, chickens should be bright eyed and alert. They will have clean legs, feet and bottoms, as well as healthy wattles. Chickens, like all birds, are very good at hiding illness so owners should watch them carefully in order to recognise any changes in their normal behaviour. Using mite and louse powders will help you avoid the most common problems. Natural alternatives are also available that will help with parasite control and maintain chicken vitality. Head tucked under the wing.